The Hubby and I look a leisurely walk today and stopped in at the local Korean market. I wanted to go in to pick up some mint leaves for mojitos tonight, and ended up getting a few extra items. Walking through the deli sections and a lovely Korean lady was giving out samples of a range of items. Some spicy squid or fish, pickled beans and jalepenos, nuts, some kimchi veg. We sampled it all, and although it was all really tasty, we settled for the pickled beans and the kimchi…whatever it is. We couldn’t quite understand the lady, just knew it was a veg. Another thing we grabbed was a giant bottle of sesame dressing – which was super low carb! Since I wanted to use it in supper, use up some of the stuff I had in the fridge, and of course try the sesame dressing. 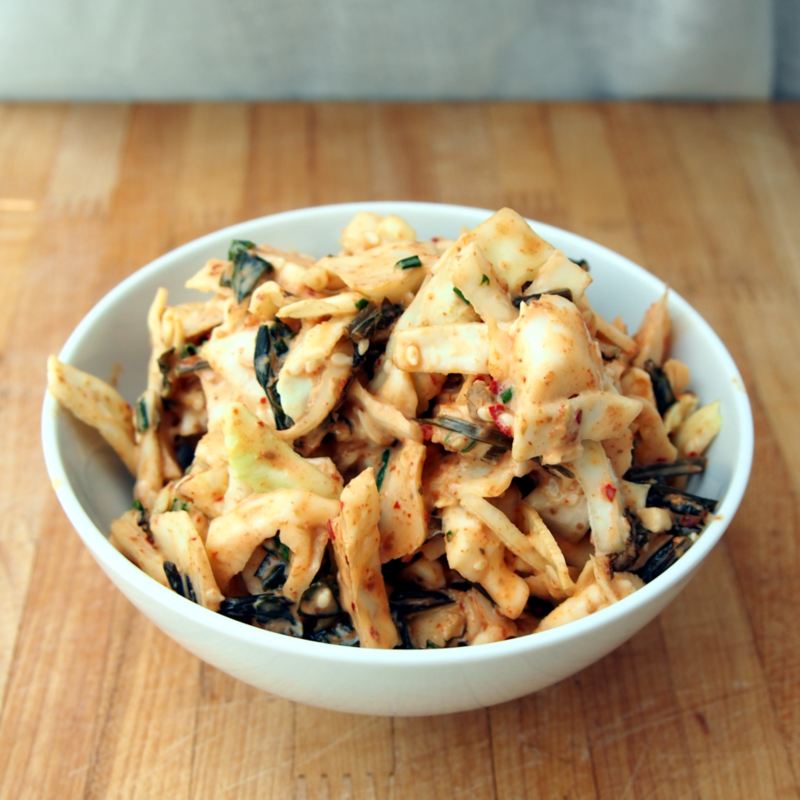 So to go with supper, I came up with an Asian inspired kimchi sesame coleslaw. It’s got the creamy taste from the sesame, backed by the kimchi kick, all with the crunch of the cabbage. We both cleaned out our bowls and I don’t foresee a problem of finishing off the 1L sized dressing. Combine all ingredients in a bowl, tossing to mix. Place in fridge while supper is being made.